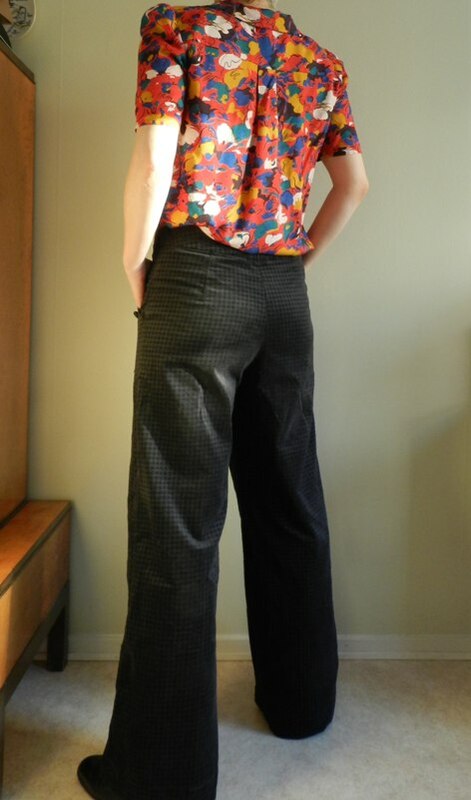 The back velveteen pants I made last year are already showing signs of wear, so I figured I’d better make an additional pair before they completely fall apart. While last year’s pants are super comfortable I do find the semi-fitted legs seem a bit plain and boring, so this time around I went for a more pronounced wide-legged shape. 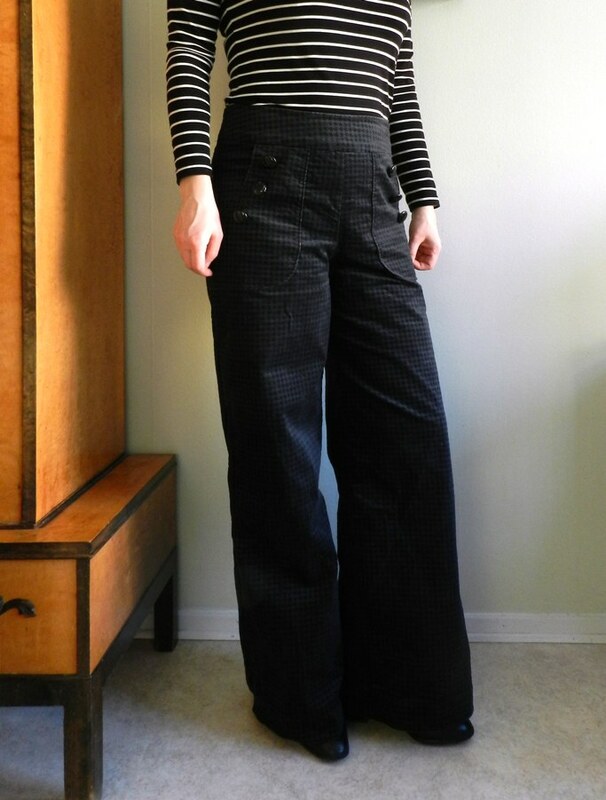 As it turned out, there is no lack of patterns for wide-legged pants in my stack of Burdastyle magazines (often with the obligatory mention of Marlene Dietrich), so the main difficulty was deciding on what pattern to use. Being short on time and wanting something not too fussy I chose #113 from the October 2016 issue. 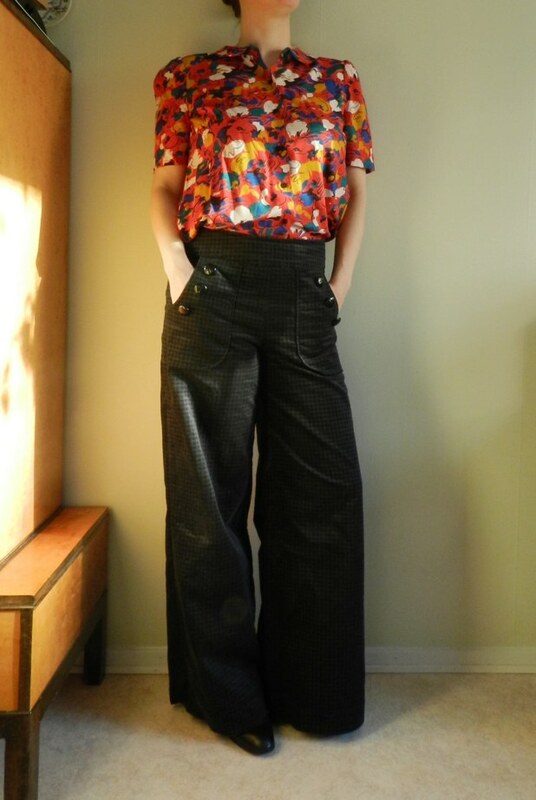 Sailor Pants 10/2016 #113 (image source: Burdastyle.com). While labelled as sailor pants, these do not have a real bib. 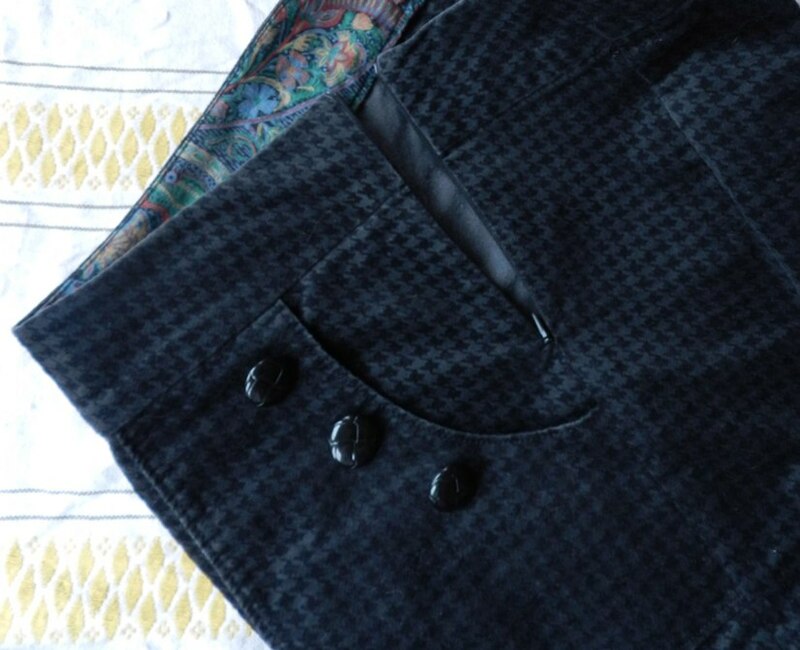 Instead, the buttons are purely ornamental and simply sewn onto the large front pockets. 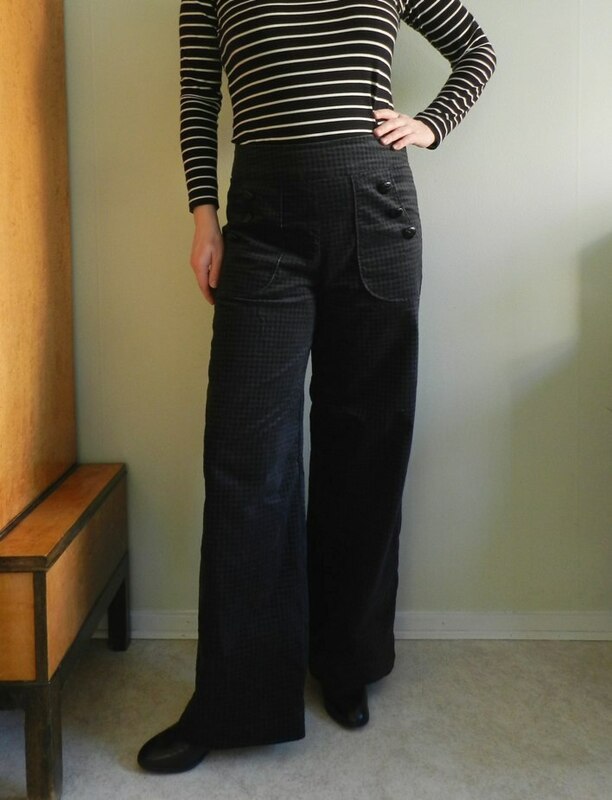 This, of course, makes it a less time-consuming project than the sailor jeans I made last year, which has a fully-functioning bib covering a zipper. Here, the (invisible) zipper is placed in the side-seam going all the way up, so there is no additional button or hook. Much faster than inserting a fly front and as a bonus the front lies nice and flat (and no risk of accidently forgetting to zip up when in a hurry). Besides the side closure and the wide legs I really like the broad curved waistband, which is more comfortable than a narrow rectangular waistband. 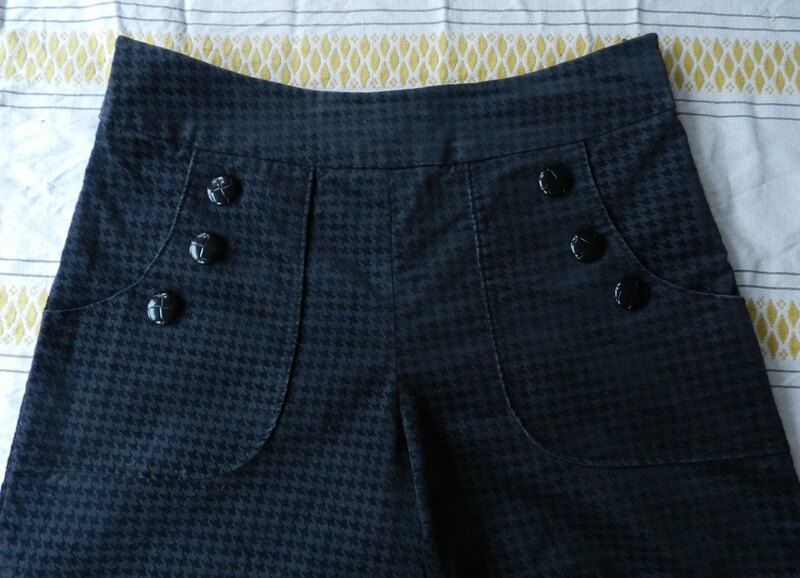 The deep pockets are sewn on and give the pants a bit of a retro vibe. They were super easy to apply and do not gape whatsoever. The back is left plain, which I thought was fine with this particular fabric that does not show off details very well. 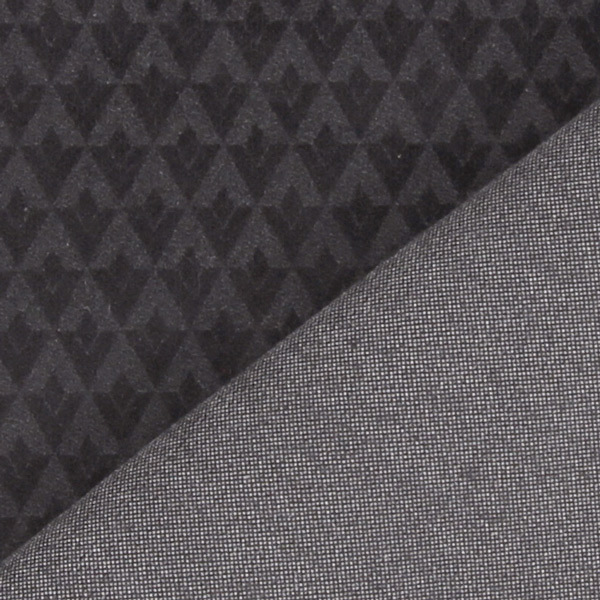 The fabric – a velveteen with a very low pile and an embossed houndstooth pattern – was bought last year from tyg.se for a reduced price of 33 SEK per meter. As a fan of black velvet(een) I got 5m at once. 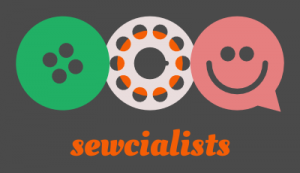 This was my fourth time ordering fabric from this shop, which is based in Germany and appears to be named differently in each country (myfabrics.co.uk, stoffen.net, fabfab.net etc.). The fabric as pictured in the web shop (image source: tyg.se). Overall, my experiences with this shop have been positive, but in this case it seems like I did not get exactly what I ordered. First of all, the embossed pattern is different from the one pictured on the website. Admittedly, it took me a while to notice, so it is no big deal. Secondly, according to the label the fabric is 100% cotton, but it actually does have quite a bit of horizontal stretch and feels like it contains some synthetic fibres too. Unfortunately, it is not as warm as I had hoped, but on the upside, it barely creases and the lack of fluffiness makes it very easy to work with. I cannot really complain anyway, as it is still good value for money and I could have ordered a swatch beforehand. These pants sewed up incredibly fast. I cut out the fabric on a Saturday evening some weeks ago, sewed and overlocked most pieces on Sunday (in between all kinds of other activities), sewed on the buttons and assessed the fit during the week and then finished the project next Saturday evening. 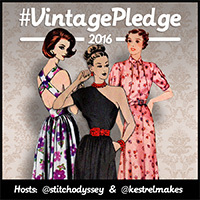 Only the buttons are sewn on by hand, the rest is machine-stitched. As for the fit, I think that I am slowly starting to understand how to adjust Burdastyle pants on pape to have a better starting point. Basically, I trace a size 40, adding 1cm to the rise and grade out to a size 42 at the waist. Overall, I am very pleased with the front and the crotch curve, but there is definitely room for improvement in the back. First of all, I took out a wedge in the center back seam (I guess what would be considered a sway-back adjustment) and should have corrected the curve of the waistband (it is now has a dip in the center). In addition, I tried to reduce some pooling between the upper buttocks and the waist by widening and lengthening the back darts. This, however, replaced one big crease with many small ripples, something which I hope to avoid next time. 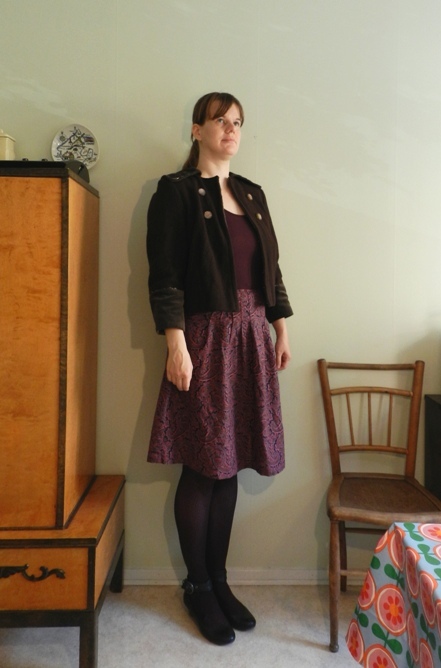 Nevertheless, while the fit is not perfect, it is still better than what most shop-bought clothes have to offer and not having a waistband dig into my abdomen is quite a liberation in itself. 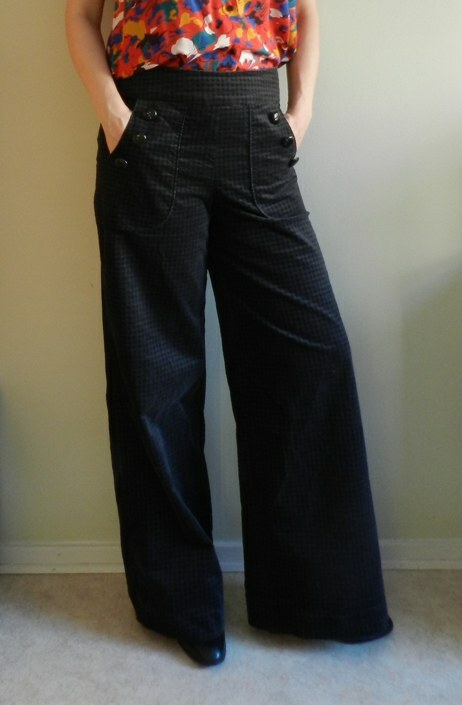 As I am not used to wearing shirts tucked into pants, I tried out different looks while taking the photographs. 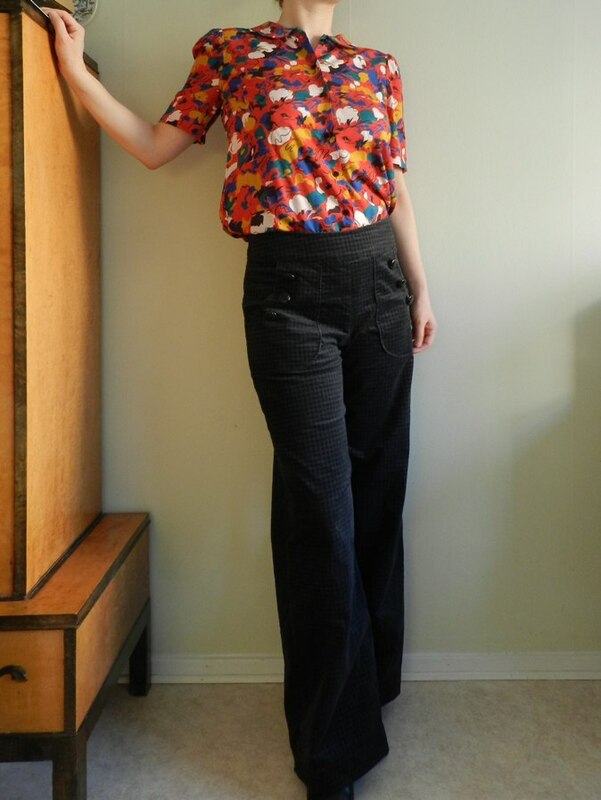 While I think the puff-sleeve blouse in vintage rayon probably looks better tucked in, I found it difficult to distribute it evenly, because it is so very wide in the back. Anyways, I think I like the pants even better after seeing the pictures and predict I will make at least one more pair this year! 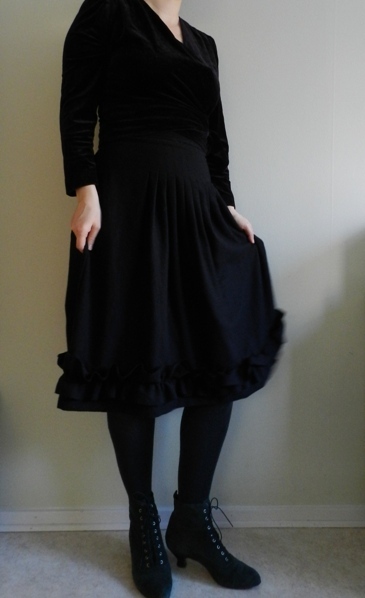 Fabric: 140cm x 2m black velveteen from tyg.se, SEK 66 (c. EUR 7). I did not use the full width of those 2m, but definitely needed the length because of the nap. Plastic buttons from the thrift store, SEK 10 (c. EUR 1) for an entire bag of at least 40 buttons. Some interfacing and scraps of cotton for the waistband and pocket lining. Thanks! 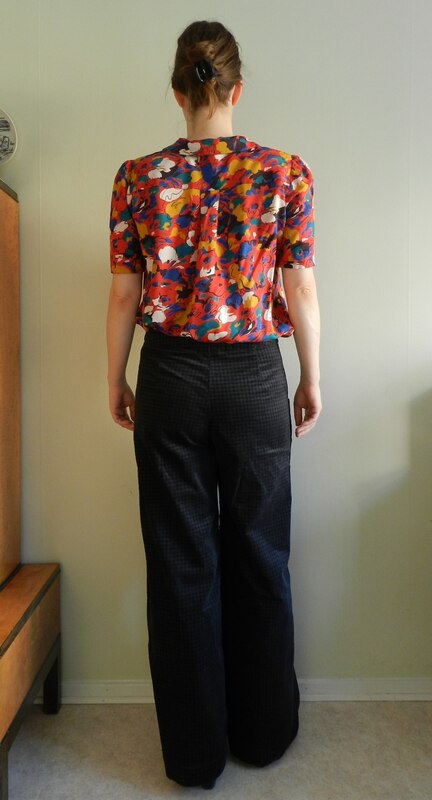 I am starting to become a big fan of Burdastyle pants patterns, they seem to have very good crotch curves and the consistent drafting makes it easier to figure out how to adjust a pattern beforehand instead of starting from scratch each time (especially since I am not that experienced at that). 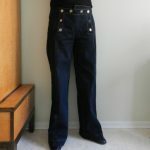 Funny that you mention jeans, as I was considering today whether I should reuse this pattern for some vintage-style jeans with a side button closure.